It was such a busy weekend. Obviously Eliza enjoyed it thoroughly, since she get to gai-gai everyday. How can she not? Now that i'm working 4 days a week, my so called alone daytime with her is on friday. So it seems like fridays are our day of the week. 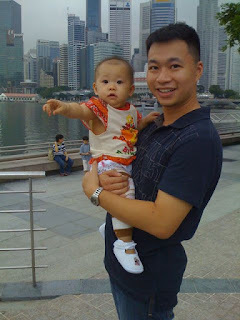 This friday, my in-laws went for a day cruise which got them out at 6am and home late at night; and Ww had school meetings till about 3pm, went training for the marathon and a teachers farewell dinner at night. So that left me & Eliza on our own. It was really cozy and nice being together like that. Now that Eliza's quite ok being left to her own devices and ransacking the house down, to a certain extent, it's easier to get things done with her, things like prepare & cook her porridge, washing & hanging clothes even..and sometimes me watching tv. I was planning to make some changes in her nap and feeding times. 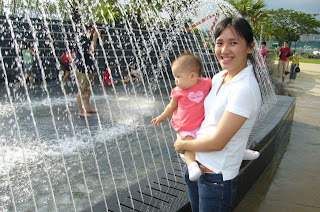 Eliza has been sleeping later and later from her usual 830pm to 9pm to 10pm. Despite sleeping later she's still waking up at 7am in the morning. One of the reasons i realized that stemmed from her sleeping late is because she's taking her afternoon nap later and thus waking up later (ie. 530 or 6pm). And knowing this playful lil girl, she can last being awake for 6hours from her last nap. When i come home from work, i usually ask my mil what time did she last wake up, as that'll give me a gauge on how early i start putting Eliza to sleep. 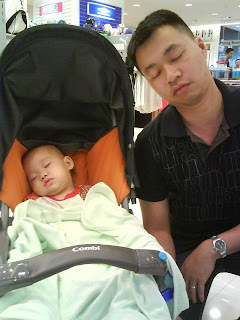 Nowadays it has been taking me anything from 1hr to 2hrs to get her to sleep. A lot of factors come in, the most sian one is distraction on her way to la-la land, she'll return from la-la-land and take a long time to go there again. By then i'm drained. She has been able to stay up till 11am or 12pm from the time she wakes up in the morning so this weekend i didn't make her try to sleep earlier. It's a little tricky because if she sleeps too early for her morning nap, she'll be sleepy at at dinner time which is not good. Saturday was a classic example. She was sleepy at 4pm, we arrived at church for meeting at 4pm, fed her milk, started meeting and had lots of ppl talking to her, she got really excited and stayed awake till she fell asleep at almost 7pm, woke at 745pm, sleepy, grouchy and hungry. She slept at 1115pm that night. It's still a while till that 1 nap days but i feel the transition and we're adjusting. I've been wanting to drop her mid-morning milk and introduce her breakfast. This weekend i managed to do it for at least 2 days so far. It was a lil tricky, hoping her naptimes doesn't interfere with her feeding times. There was a little mess of the schedule but still she was well fed. 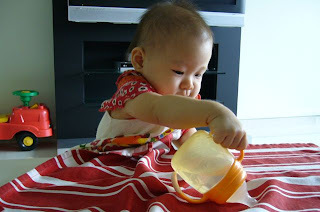 Essentially, if she is able to continue to wake up at 8am, then hav bfast after that, then comes lunch, then milk, dinner milk. Here's how everything went this weekend..
at least these racks are better than the book shelves...cos she'll pull all the books down! oh my itchy hands little girl. 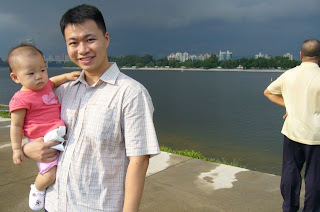 After that we had to go for a meeting at church which i wasn't too keen on bringing Eliza to. Eliza in a meeting? Actually i was hoping she'll drink her milk and sleep along the way, but we were running late and Ww said there's hot water at church. Alas she was happily happy in the taxi, and when we got to church, everyone wanted to talk to her, and she was even happier in the library where we were having the meeting. She was talking to Jiejie wannabes Shuyi, Jane, Dianne. Seems like she's becoming more of a social gal eh? Last time she'll look suspiciously at most people. Still she's not keen on letting anyone carry her. 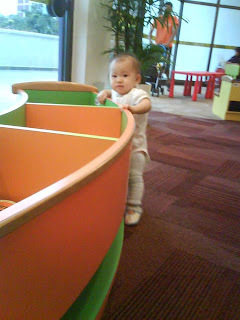 Anyway she happily crawled up and down, here and there till she got bored of the place. I brought her to the main santuary where we watched music prac going on, and she wanted to head towards the piano or whatever she can get her hands on...yes, the books on the pews as well. 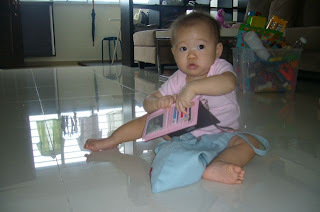 I think she was on overdrive liao...awake since 1230pm. tsktsk...eventually she knocked out at 645pm for a short nap. Guess what time she eventually went to bed? 1115pm. Gosh so many late nights Eliza!! 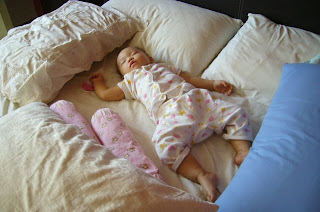 I watched her sleep...and she looked so contented. How do you describe it? feeling all so nice and warm inside. 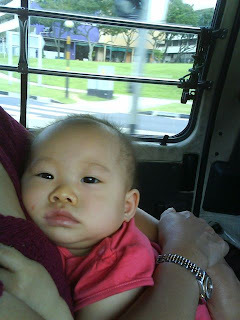 Anyway we wanted to go out for a good lunch, Eliza was still sleepy even on our way out. Yeap...evidence we were there...check out Eliza's grinny face. 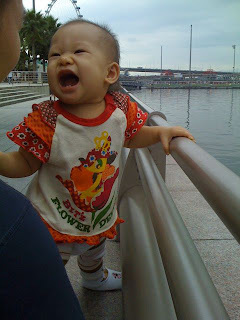 she looked really cute here...seems like she's really happy sitting there. Ww trying to get Eliza to wear her hat...actually she lets us wear it for her when there's sun, but once we're in the shade she'll take it out. It's Eliza's birthday celebration next weekend!! We had lunch at Sake Sushi with my dad & mei...and Eliza enjoyed the spread, on top of her porridge. She tried the chawanmushi, salmon, bean curd, soba, rice. No wonder she could sit with us throughout the meal. After lunch she fell asleep at about 3pm and we went to catch a cup of coffee at Gloria Jeans and then went to walk around. This is Ww doing an inpersonification of Eliza....which is quite similar yah? Anyway Eliza slept till 5pm..it was a loooong loong nap. Nowadays she tends to take 1.5-2hr naps in the afternoons. so i love taking afternoon naps with her..quite fruitful, usually. Eliza pointing to something..i dunno what. 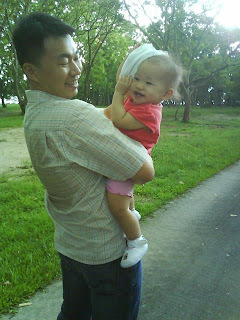 Eliza telling daddy i love being outside!! 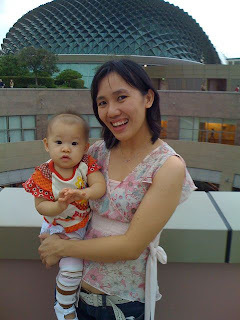 At the esplanade roof terrace...it's not easy trying to get an expression from Eliza when taking photos like this. we'll usually sing a song so that she'll start clapping and smile...else she'll give that expressionless look. mummy why u give me such weird food??? Recent favourite activity: ransacking pockets, wallets, bags...of course my wallet isn't spared. 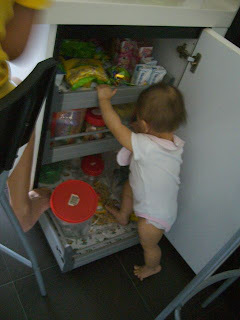 Interestingly, she finds the thrill in taking things out only...after her successful attempt, she'll just give it to us. Her top 2 front teeth is growing!! finally! 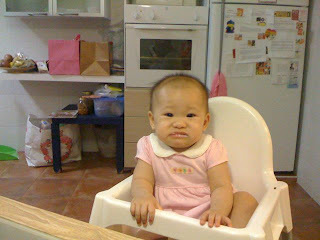 On the day we discovered that she was extra cranky during her lunch, refusing to eat at all after a few mouths. her mouth was really closed tight! I'm wondering if her lack of teeth affects her from articulating more sounds. On that week she started rejecting her porridge, the ease with feeding her for the past 3-4 months just went down drastically. 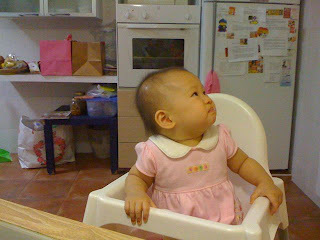 we needed to keep her hands occupied to get her to eat, or else she'll be turning her head left and right or refusing to open her mouth. we tried to experiment with other food like meesua which was quite a hit cos it's different i think. mashed potato worked too but not so much. i bought baby pasta, but my mil tried cooking it and said it didn't get soft. On the other hand, she loves our food. whatever we put into our mouth she'll definately have a go at it. So far i'm letting her stay away from sauces, oily/fried stuff, spicy stuff, food that has loads of seasoning on it, sweet stuff too like cream or chocolates or ice-cream or whatever's sweet. I think sleep is always such a mystifying thing with babies. How to get them to sleep, how to get them to sleep longer, etc etc etc. I've tried to take all the 'success' stories i've read or heard with stride and believe that sleep patterns is 70% baby temperament 30% conditioning. for a few days i was having difficulty getting Eliza to sleep, such that by the time she falls asleep it was 10pm and i was exasperated. i've all kinds of rationalization about why she's not sleeping & the like....too hyped up, milk before bedtime makes her extra awake, she can't bear to stop playing, she needs to burp. 1. Milk. success rate not too high because sometimes i need to get her to stay seated or upright enough to burp (else she'll cry in the middle of the night cos of gas). sometimes she just gets even more energetic after milk! 3. Carry her and rock her to sleep. this has the highest success rate of them all, although it'll backfire at times with her struggling to get out of my arms. actually it's the only way to get her to concentrate on going to sleep, when there's no toys or potential things to play that will distract her. I read that it's not good to rock your baby to sleep at this age...but i don't care already, i just need her to sleep. 4. Be outside. It's the only time i'm not particularly fussy about her going to sleep...and i know if she's sleepy enough, she'll sleep on her own. No signs yet...but she can stand on her own for a few seconds before she'll squat back down carefullly. 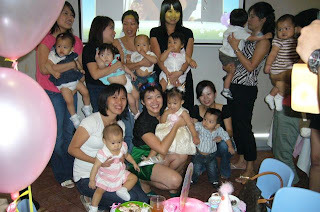 Ww & I will wonder how smart God is to make babies grow up & develop in such a way....and to grow up so adorably! Party preparations is finally in progress. I know Eliza loves going out but having to book a place is a hassle that Ww won't be keen on at all. So we'll be having it at home, which Ww also asked, are we doing this every year? (no, not that big, i assured him). Anyway, starting to find the caterer & cake. That's about it. Maybe buy balloons & do up the glass wall. I've done the cards! (was doing BK&C's thank you dinner card before starting on Eliza's one...i wish i have a better printer and better paper to print on...anyone heard of digital offset printing??) Anyway, actually finding the photo was more difficult than doing the card. In the end i had 8 series of the same 1 card type cos i couldn't decide which photo to use. Someone was asking what to get for Eliza...honestly i haven't been thinking about it. 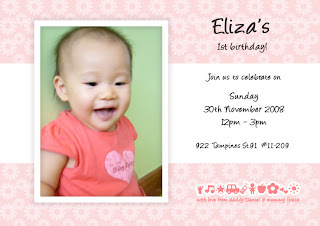 Just hoping i can get good photos on that day and that Eliza will be friendly enough to enjoy all of it! Just some of the things Eliza's up to...I feel too busy to post more things especially since Eliza's sleeping later and later (tsk tsk resisting sleep..this girl...). 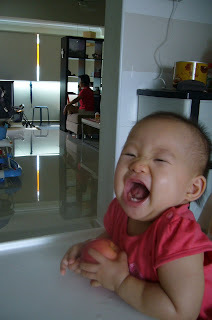 I love this photo of her tickling (or torturing?) the panda bear. 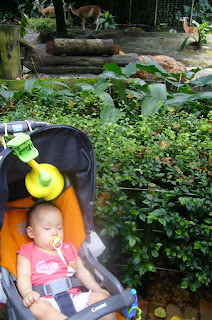 We went for a short short trip with her cousins, and her cousins cousins to the zoo. 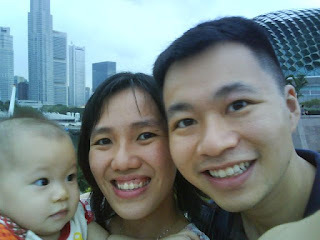 It was PUB's family day and we had free tickets in. Wasn't too eventful as there were soooo many people, we had 6 adults and 5 kids + 1 baby in tow, and one of them wasn't feeling well (had diarrhoea). We were out at 830am and home by 2pm. we didn't even go to the kids zoo section!! :( Next time Eliza's slightly older, i would love to bring her there to find the animals! Well..here she is as evidence that she was there...she fell asleep about 12pm and slept all the way home. Guess what is Eliza so delighted about? Apple. She loves checking out the apple and finally biting through the skin to savour the sweet apple. then again, she's just being her, the excited & expressive lil gal. 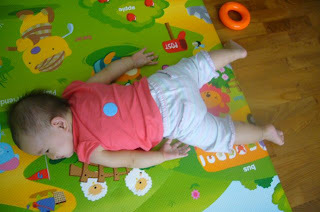 I've been wanting to catch her in action doing this 'tang3 tang3' or 'lie down' action. And yes here she is! When we ask her to lie down, she will go into this lieing down position with her palms up, smiling away...and that lasts barely 10 seconds.